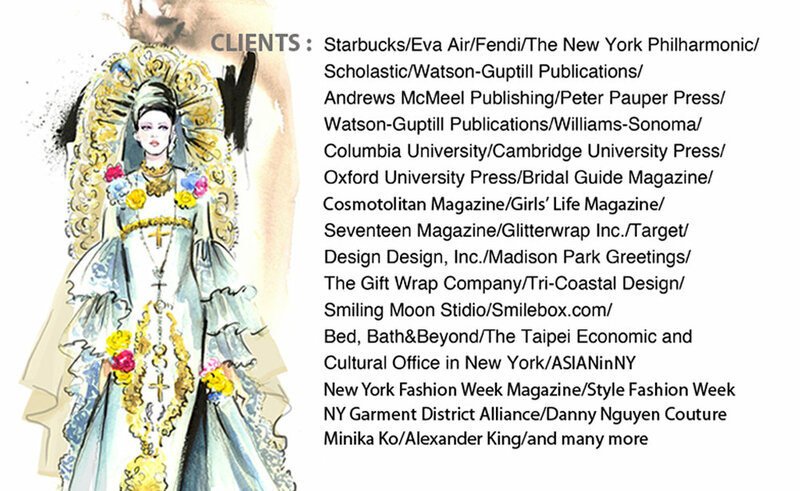 I am a NY-based fashion illustrator with a love for contemporary glamour and elegant touches. I work with fashion, beauty, and lifestyle brands to create modern and stylized illustrations for creative campaigns, editorial contents, surface patterns, branding and more! My expertise includes digital and watercolor illustrations, especially integrating opposing elements such as traditional and modern, Eastern and Western, and art and technology into my illustrations and designs. I teaches Fashion Illustration, Digital Art, and Art Licensing classes and workshops at Pratt Institute and various art colleges and institutions in Taiwan. During New York Fashion Week, I do live fashion portraits for the guests and fashion models during fashion shows, and she is regular fashion illustration contributor for the official New York Fashion Week magazine. I was also invited by the Apple 5th Ave flagship store and Apple Store Upper West Side to demonstrate how to use sketching apps like Procreate, Paper 53, and Zen Brush to create amazing fashion illustrations, modify photos, and shared tips for creating a digital portfolio. I am a mother of two lovely and active children, they are my constant inspiration! I can be reached at ninahedwards@hotmail.com or IG: @metropolitanmiss for commission, licensing, live fashion sketch, and private art lessons.